From the sun and the winds island in the Baltic Sea – Öland – comes a crunchy, good crispbread. We who bake this bread is Joakim & Gunilla Yngdén and we come from Borgholm, Sweden, where also our bakery is located. After several years in the pastry/bakery industry, we decided to go for something of our own, and it eventually resulted in Yngdéns Knäcke HB. Today, the company has been around for seven years and we bake both crispbread and Italian biscotti. We have no store of our own, we only sell to wholesalers, restaurants and delis around Sweden and Denmark. Now it´s possible for you to taste this good crispbread baked with coarse rye flour, flax, sesame and sunflower. A healthy bread which tastes good cheese and some paprika rings on top. For breakfast, as snacks or crackers for the cheeseplate. Then you can choose our bag with crispbreadcrackers, the small pieces where you can put a piece of stored camembert or a spicy goatcheese, and maybe garnisch with a dollop of tomato marmelade. Enjoy your meal! 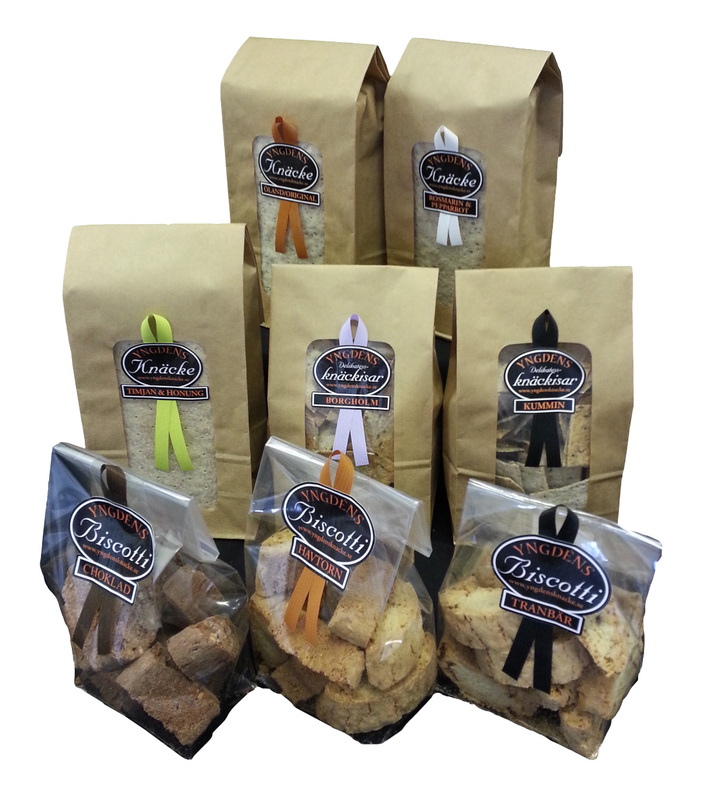 The warm and dry summer climate on Öland have also inspired us to to get something from sunny Italy to eat with your coffee – Biscotti. But to put some local stamp on our biscotti, we mix down some typical berrys from Öland in the dough before baking the biscuits – cranberries in some and buckthorn in others. Now we have also begun to bake deliciously good biscotti with the taste of chocolate, and our latest innovation is biscotti flavored with juice and lemon peel of fresh lemon!